Apple is a classic example of the firms whose weak analyst relations is most costly: companies that supply the consumer technology channel. Companies like Apple and Samsung have a consumer focus, but many of their markets are dependent on sales channels like retailers and mobile operators. These firms can see that they are consumer brands with direct relationships with clients. However, they often cannot see that their principal customers are businesses that are hugely dependent on analysts’ services, including the VARs that gather at the Channels Forum. A further weakness is that they cannot see analysts’ impact on their share prices. 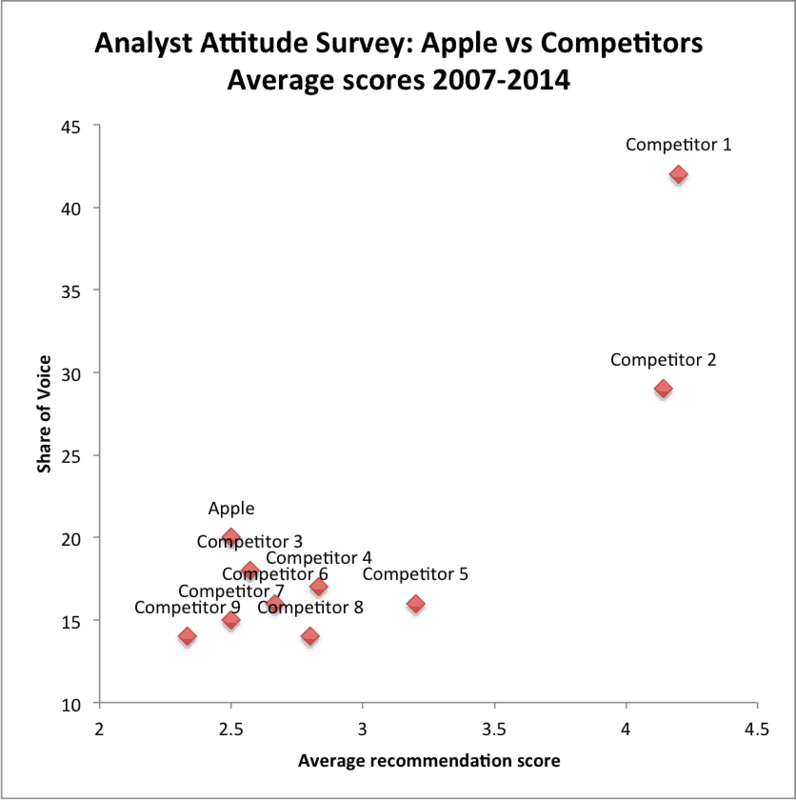 The chart on the right compares Apple with some competitors, using data from our Analyst Attitude Survey. Despite the large share of the analyst community able to comment on Apple, it is less likely than most of its competitors to be recommended by analysts. A glance at Gartner’s coverage shows how uneven analysts’ enthusiasm can be, even at the firm that vendors communicate with the most (including many of Apple’s partners). In that respect, Apple is no different from many of its peers. One analyst told us:- “The pitch for Microsoft’s Kin and Amazon’s Fire Phone went terribly. Worse, they completely dismissed the negative feedback at the time.” Generally, consumer device businesses are terrible with analysts, even in firms that do AR well for their enterprise business. Product managers are often advocates who cannot give a nuanced picture and don’t speak realistically about the competitive space. That said, some firms have done very well. BlackBerry and Qualcomm are especially great counterpoints. Each firm has had ups and downs, but for most of the last decade they have been consistently strong. BlackBerry has had a great team: responsive and helpful, with strong events. Strategy was certainly hard to explain, and that reflects the reality of their company. Qualcomm has been proactive, regular and engaging despite their single location in California. They have reached out globally, and their annual analyst conference does an outstanding job of giving both technical details and high-level strategy. Perhaps the strongest segment where the difference produces results is the market sector for cell phones and media devices sold by mobile operators. Operators are among the largest and most comprehensive users of analyst services. They understand the impact of manufacturers’ direct brand equity with consumers, but they also use analysts to ensure they have the strongest portfolio of solutions. If manufacturers wanted to expand their market share in the cellphone market, for example, analyst relations would certainly be the most powerful lever because of the generalised weakness of such B2B2C brands’ AR. Hi Duncan. I’m not surprised that Apple aren’t good at AR but I’m pretty sure they aren’t losing any sleep about it.. Qualcomm aren’t in the same market and Blackberry are hardly a shining light for how positive AR recommendations improve your market position, however good their AR programme was. The reality is that there are new players, playing by new rules in markets where the traditional analyst recommendations carry very little weight.